Todd, the webcast seems to have been taken down, do you have an alternate url? The video has been fixed, so you should have no problems viewing it now. Enjoy! I'm trying to view this webcase because it's exactly what I need to do with my site, but get an error. A screen comes up saying 'Unable toembed this contenttype. Download this media.' So when i click to download it, it errors out. Can I get this webcast somehow? 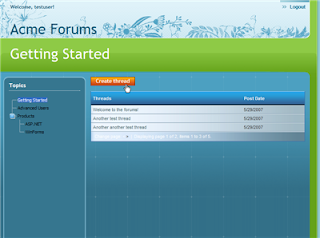 The code isn't available for these forums (yet), but I'll be sure to let you know if it is. Just stay tuned to this blog. I was wondering if a newer version of this has com out yet with the latest and greatest of VS 2008? @Amanda- It's not quite the "latest and greatest" of this app, but we did recently ship a new Telerik MVC Forums demo app that you download here: http://demos.telerik.com/mvc. It is functionally very similar, so take a look and let me know if that works for you. okay thanks! when i go to that link though, where do i go after that to actually download the forum demo?